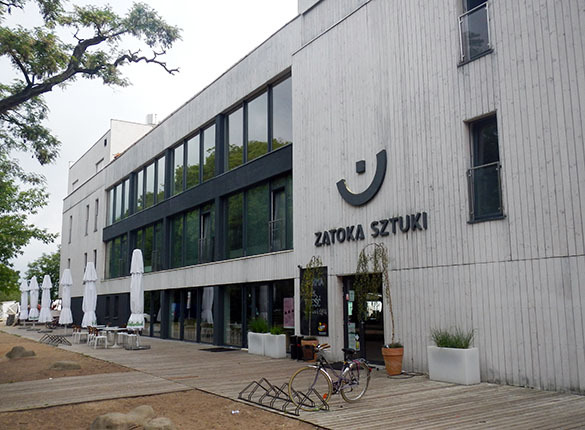 SOPOT, POLAND — This morning we had the final set of talks at Larwood 2014. Out of all the presentations, the one that struck me the most was by Paul Taylor and Andrea Waeschenbach entitled “Molecular phylogeny and the adequacy of skeletal characters in cyclostome taxonomy: The alarming case of Diaperorcia purpurascens.” Paul is shown delivering it above. 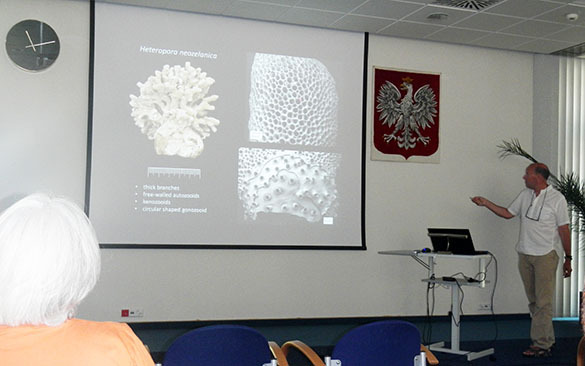 This project represents the best of what these bryozoan conferences are about: the combination of biology and paleontology to further our understanding of the evolution and ecology of this large phylum. It also warned paleontologists to never be complacent about the value of morphology (shape and form) for sorting out systematic and evolutionary relationships. 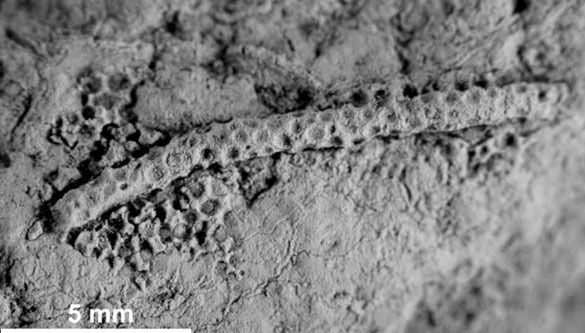 Diaperoecia purpurascens is a “fixed-walled, tubuliporine” cyclostome bryozoan species common in New Zealand waters today. Molecular sequence data, though, shows it is without a doubt within the “free-walled cerioporine” cyclostome genus Heteropora. You don’t need to know why those terms actually mean to understand that the molecular work has shown that two dissimilar groups share a surprisingly close common ancestor — so close that the systematics are now fully disrupted. When we knew only the morphology of these bryozoans the differences between them were apparent at a high taxonomic level. Now that we have molecular data it is brutally clear that our reliance on shape and form to separate the groups was an illusion. Molecules trump skeletal evidence — and all paleontologists have to work with are the skeletons. 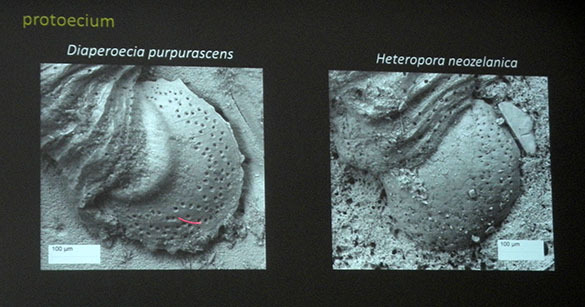 Paul and Andrea did find, though, that in the early colony growth (astogeny) of these bryozoan groups they share a common pattern of tiny pores (pseudopores) on the earliest portion of the colonial skeleton (the protoecium; see above and below). It is this morphological feature, as subtle as it is, that shows the groups share a close common ancestor. The lesson is that paleontological systematics are always provisional. We do our best with morphology alone because that’s what we have, but we should be forever haunted by the knowledge that we lack full biological evidence. 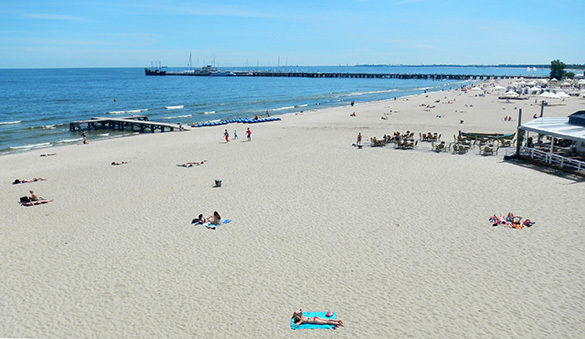 SOPOT, POLAND — Our first day of the Larwood Meeting was much fun, especially after I unloaded my presentation in the morning and could relax. We are gathering on the beautiful campus of the Instytut Oceanologii (one building pictured above), which is within an easy walk of the hotels and the beach. Just under 50 people are participating, from beginning PhD students to retired faculty. These meetings are also a mix of biologists and paleontologists who are interested in bryozoans, so everyone learns a lot from the talks and posters. All that is required is some intersection of the presented material and the Phylum Bryozoa, which can include evolution, systematics, physiology, ecology and genetics. This kind of scientific conclave is rare with its interdisciplinary diversity. Piotr Kuklinski, our leader and senior staff at the Institute, opened this morning’s session with a greeting and orientation. Note the proud Polish eagle behind him. Here’s a view of my hipster hotel. Hard to tell its a place to stay when you walk in. It looks (and sounds) rather more like a nightclub at times. Very comfortable, though. I thought Dr. Pollock would appreciate the very distinct intrusion in this glacial erratic found in the nearby park. Tonight we have a mysterious dinner “in the Eastern European forest”. I shall report later, if the wolves don’t get me. 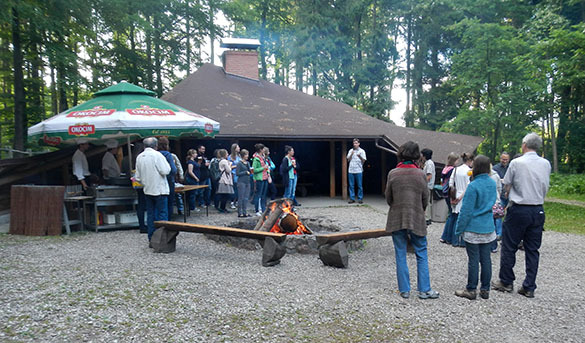 SOPOT, POLAND — Our surprise dinner this evening was a Polish barbecue in the forest outside Sopot. 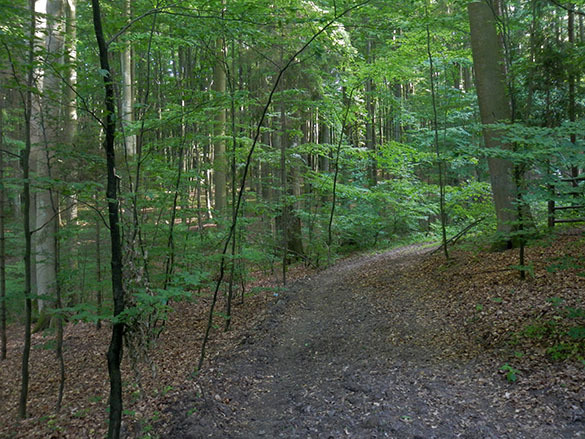 I am impressed with how much forested land has been preserved around the three connected cities of Gdansk, Sopot and Gydnia. With a half-hour drive we arrived at a campsite well isolated from the urban build-up. The excellent food included wild boar, chicken, fish, cold beet soup, and various permutations of cabbage. I was pleasantly surprised to find that my dish of roasted potatoes were actually baked and sweetened apples. We talked and talked, of course, and played darts and fired hard beans with a slingshot at suspended buckets. (Some people were scary-good at this.) It was a great social event that tied the group together in new ways. 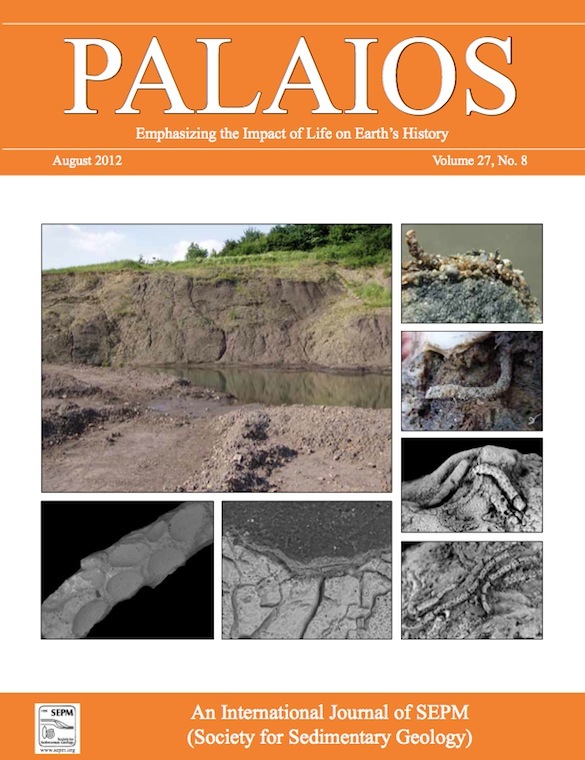 The fossils this week celebrate the appearance of an article in the latest issue of Palaios authored by an international team led by my good friend and colleague Michał Zatoń (University of Silesia, Poland). The fossils are strange polka-dotted tubes encrusting Middle Jurassic oncoids and concretions from the Polish Jura — a place I enjoyed visiting last summer with Michał. The fossils were quite mysterious to us, but with the help of our new colleague Yasunori Kano (The University of Tokyo), we think we now have a good idea what they represent. Above you see one of the tubes on a concretion. The polka dots are actually small, regular divots in the sides of the tubes, as shown above in this view through a scanning electron microscope. It turns out that these concavities are the same size as ooids (rounded carbonate grains) in the depositional environment. In fact, occasional ooids are still in their holes, as shown by the white arrow in the image. In this cross-section through one of the tubes, each of the exterior holes is lined with a thin layer of carbonate, which is apparently the outer layer of an ooid that was cemented into each space. The tube itself is completely occupied by fine carbonate sediment. Our hypothesis is that the tubes were formed by some sort of polychaete worm similar to serpulids and sabellids (with which they are associated). 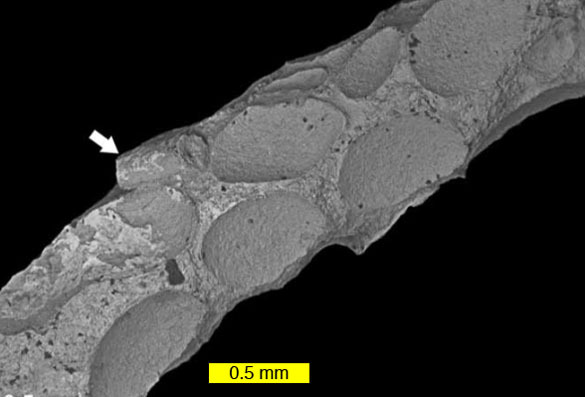 The worm may have built a hollow living tube by gluing ooids together and possibly taking advantage of the quick-cementing characteristics of this Jurassic calcite sea. It may have then fed on the surrounding microbial mats that covered the concretion and oncoid surfaces. 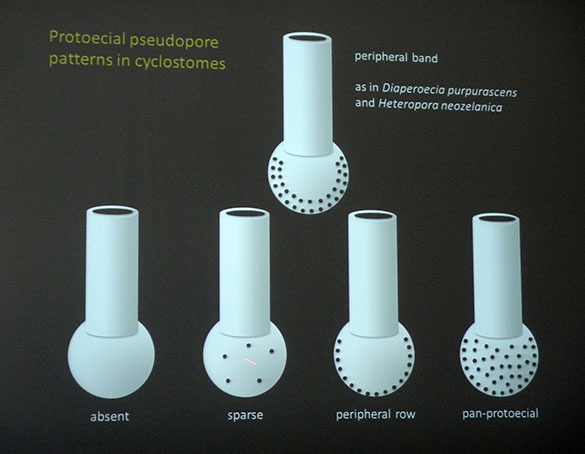 This hypothesis explains the sessile nature of the tubes, their shape and construction, and their association with thin mineralized layers formed by cyanobacteria. 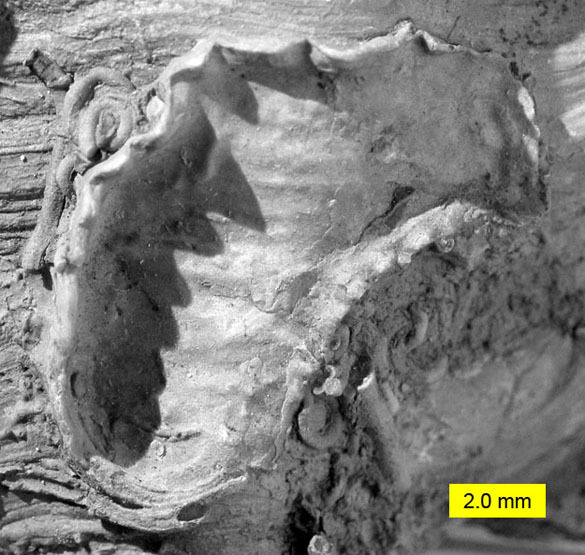 No polychaetes today are known to build living tubes out of ooids, so these Jurassic forms are thus far unique in the fossil and living record. It was a fun paleontological puzzle to tackle with my friends! Zatoń, M., Kano, Y., Wilson, M.A. and Filipiak, P. 2012. 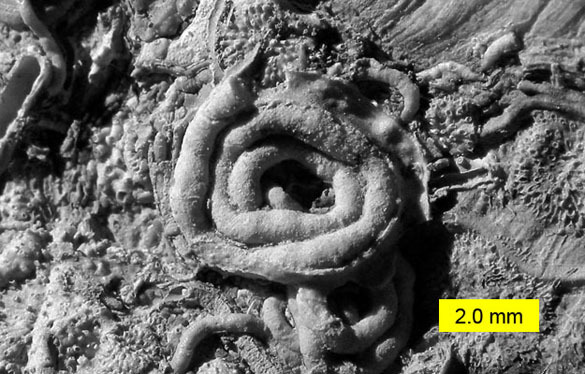 Unusual tubular fossils associated with microbial crusts from the Middle Jurassic of Poland: agglutinated polychaete worm tubes? Palaios 27: 550-559. Zatoń, M., Kremer, B., Marynowski, L., Wilson, M.A. and Krawczynski, W. 2012. 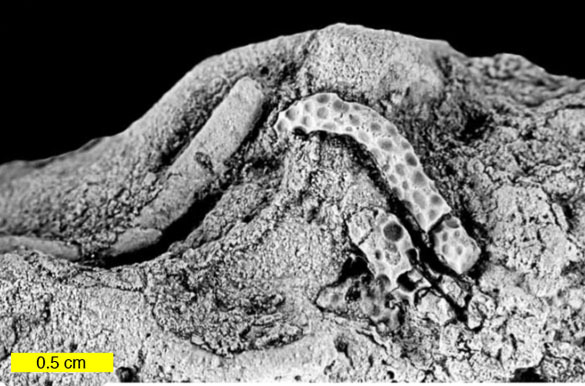 Middle Jurassic (Bathonian) encrusted oncoids from the Polish Jura, southern Poland. Facies 58: 57–77. 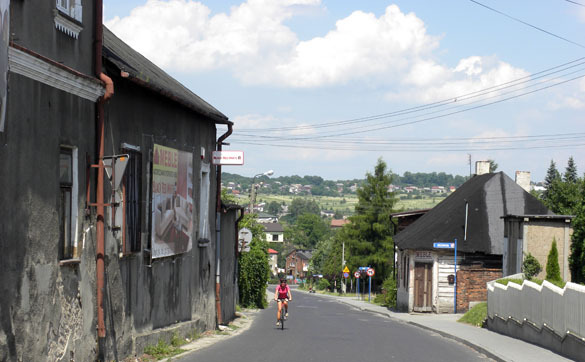 SOSNOWIEC, POLAND–A most memorable day traveling through part of the Polish Jura with Michał Zatoń and his delightful family of his wife Aneta and son Tomasz (4 and a half years old). The Polish Jura, also known as the Kraków-Częstochowa Upland, is a long exposure of Upper Jurassic (Oxfordian) limestones in southwestern Poland. We saw a bit of the rock yesterday — a hard white carbonate with a core of lithistid sponge mounds. The area is deeply eroded by karstic processes and so has vertical cliffs, pillars of limestone, sinkholes and caves. 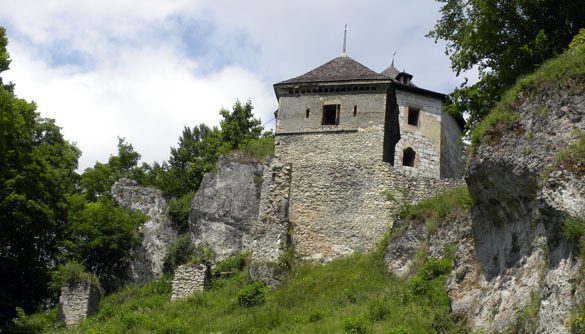 Since at least the 14th Century there have been stone fortifications (called “Eagles’ Nests”) built on these rocks overlooking the deep valleys and access to inner Poland. One of these is the Castle of Pieskowa Skała shown above. Michał Zatoń showing how the Jurassic limestones are used to effectively lengthen and strengthen the castle walls at Pieskowa Skała. When bedrock is used like this it is called evocatively “living stone”. A similar use of living stone was recorded in this blog two years ago from Jerusalem. 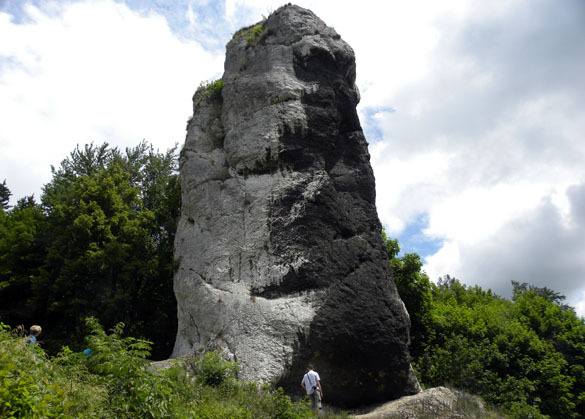 A large karstic pillar called Hercules’ Club near the Castle at Pieskowa Skała. 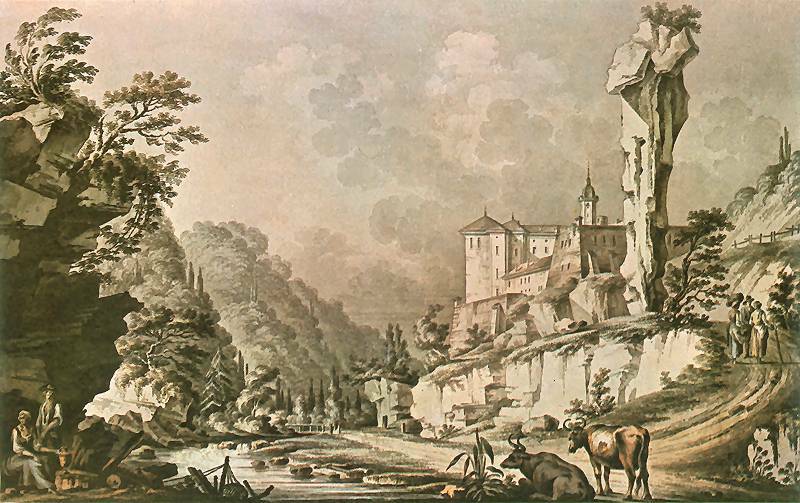 It is juxtaposed with the castle most dramatically when viewed from down in the valley and is included in almost every early drawing or painting of the castle. 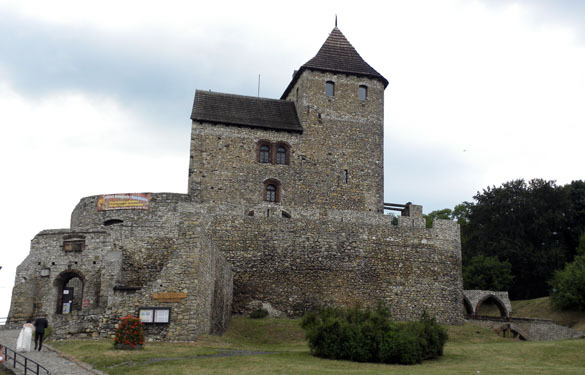 Another one of the Eagles’ Nests is Ojców Castle built in the second half of the 14th century by King Kazimierz the Great commemorating the exile and hiding in the area of his father Władysław Lokietek (called “The Elbow-High” because of his stature). The cliffs give this castle (now in ruins) an excellent view of the valley below. 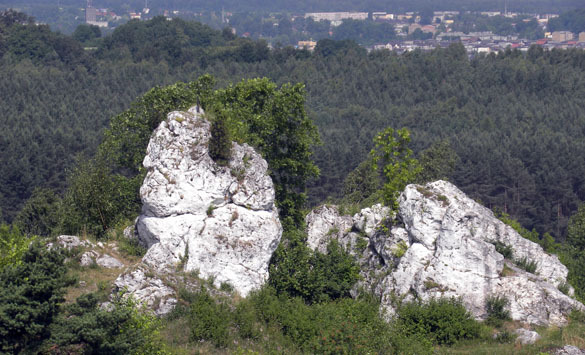 The 14th Century King Władysław Lokietek mentioned above hid from his rivals in this karstic terrain. There is a legend that he took refuge in this particular cave now called “Grota Lokietka”. It is a good excuse to develop the cave into a tourist attraction. We walked through the slippery, dark and cold passages and chambers with a large crowd of enthusiastic Poles examining cave structures and listening to tales of cryptic royalty. 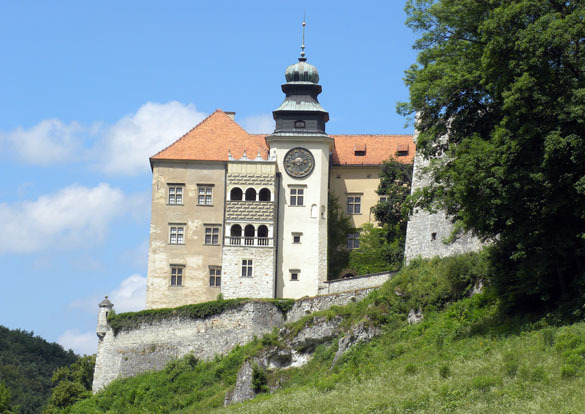 The third castle of the day is not in the Polish Jura, but I’ve included it for completion. It is Będzin Castle in Będzin, a small city next to Sosnowiec and the home of Michał and his family. It too was built in the second half of the 14th Century and obviously took advantage of the local geology, in this case exposures of Triassic limestones. More on the tragic history of Będzin in a later post. We had a very interesting, informative and touching tour of the city center near the end of the day. I again want to thank my Polish paleontologist host, colleague and friend Michał Zatoń for arranging a wonderful and productive visit. I shall return with Wooster students someday soon. I am certain they will enjoy their visit and work here as much as I have. SOSNOWIEC, POLAND–It could not have been a better day for field work: warm with a light, cooling breeze and plenty of leafy green shade. Our team consisted of me and three Polish scientists: Michał Zatoń and Wojciech Krawczyński (I work hard to get those special Polish letters in there!) 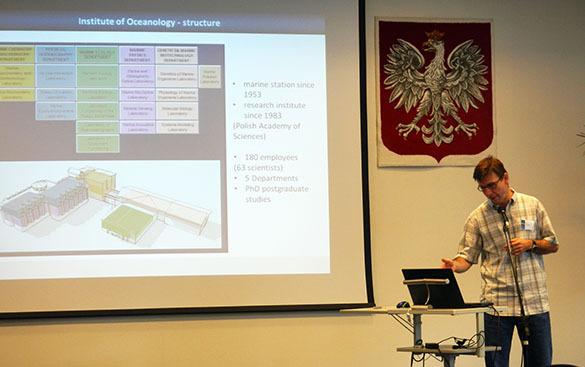 of the University of Silesia, and PhD student Tomasz Borszcz of the Institute of Oceanology in Sopot, Poland (near the famed city of Gdansk on the Polish Baltic coast). Our goal was to simply see some Jurassic rocks and fossils and talk geology. Mission accomplished. The top image shows outcrops of remarkable lithistid sponge mounds from the Oxfordian (earliest Upper Jurassic) punching up through the forest cover a few kilometers northeast of Sosnowiec. They formed relatively deep on the Jurassic seafloor and supported an associated brachiopod community. I was able to visit for the first time one of the localities from which large Middle Jurassic oncoids (cobbles and pebbles covered with the deposits of microbial biofilms) were found and became the basis for a paper co-authored with Michał and Wojciech. In the picture above of a broken cobble you will notice bivalve borings (Gastrochaenolites) penetrating from the outside. 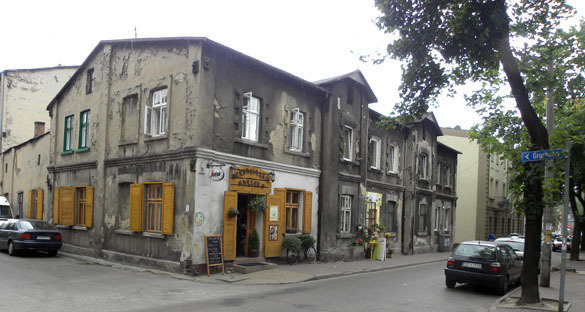 Lunch was in a tavern near the town square of Sławków in the Silesian Highlands. The Polish custom of carving the date of the building on the central roof beam meant we could see right away it was constructed in 1701. (It seems to be preserved in a modern shell of some kind.) I had a typical Silesian meal of rolled beef and dumplings (I think). A view of the Silesian Highlands from a street in Sławków. This small city is the western terminus of the Broad Gauge Metallurgy Line, a rail system designed “in communist times” to transport iron ore from Ukraine to iron smelters in Poland. The rail gauge in Ukraine and points east is wider than the standard gauge in western Europe. Our last stop of the day was to a set of deep holes in the middle of a forest. Amateur fossil collectors dug through about two meters of soil and Pleistocene sediment to expose a layer of Callovian (latest Middle Jurassic) rock rich in ammonites, belemnites and other fossils. The three paleontologists, in typical paleontological poses, are from the right Wojciech, Michał and Tomasz. SOSNOWIEC, POLAND–A day in the lab with my colleague Michał Zatoń at the University of Silesia. We sorted through two very different paleontological problems with a microscope and a lot of hand waving. The first task was to come up with a hypothesis about the origin of the strange pitted tubes shown above. 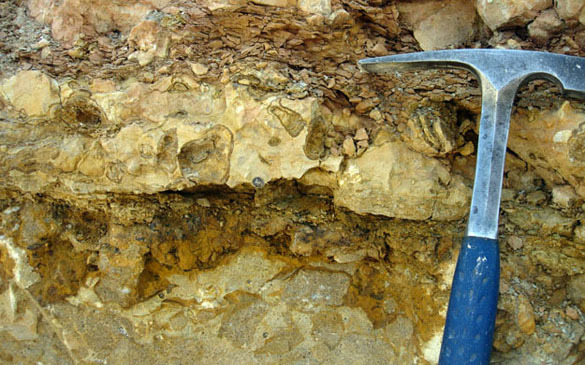 They are found on hiatus concretions of the Late Bathonian (Middle Jurassic) exposed in Zarki, Poland. 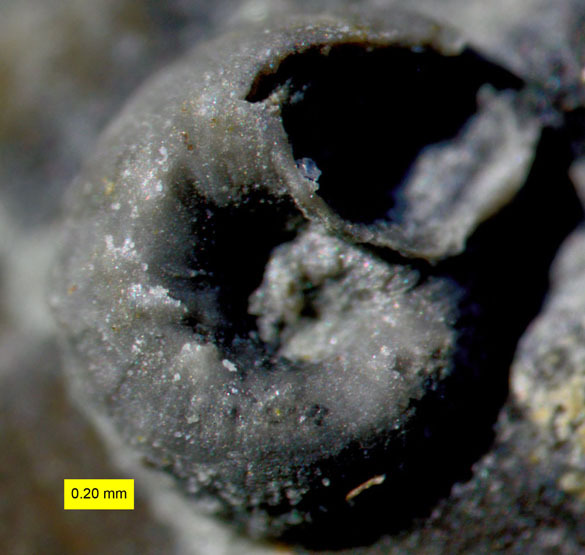 We recently described and analyzed the sclerobionts on and in these concretions (see Zaton et al., 2011), but these tubes remained a mystery. We think now that they are remnants of egg cases laid by gastropods (snails) on the undersurfaces of the concretions, and we’ve started on the manuscript. 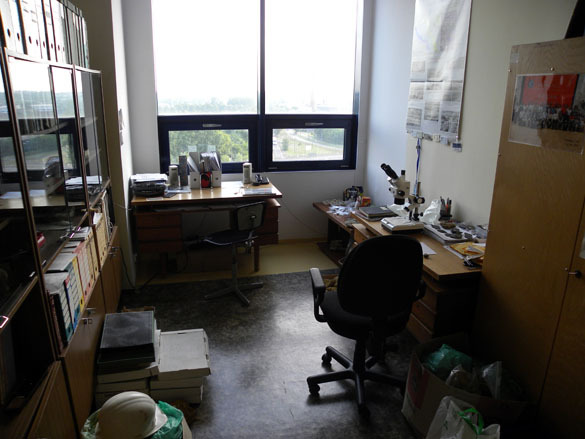 Michal's office/lab in the Faculty of Earth Sciences, University of Silesia. Tomorrow we set off for fieldwork in the area so I’ll post pictures of the wonderful Polish countryside! Zatoń, M., Machocka, S., Wilson, M.A., Marynowski, L. and Taylor, P.D. 2011. Origin and paleoecology of Middle Jurassic hiatus concretions from Poland. Facies 57: 275-300. SOSNOWIEC, POLAND–I arrived today in Poland to work for a few days with my friend and colleague Michał Zatoń of the University of Silesia. We are going to study together some of of our favorite fossils (microconchids and other sclerobionts) and then visit local quarries in the Jurassic. This trip is supported by the Henry Luce Fund for Distinguished Scholarship at Wooster. On Friday I fly on to Estonia where I’m meeting Rachel Matt (’12) and Nick Fedorchuk (’12) for their Independent Study projects in the Silurian carbonates on the islands of Hiiumaa and Saaremaa. 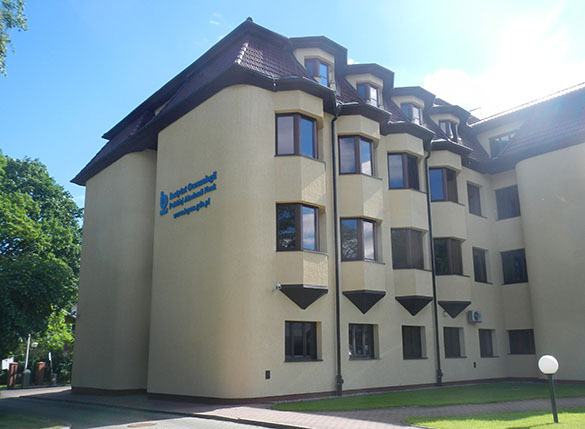 Michał’s department is located in Sosnowiec, a city that is part of the Katowice Metropolitan area. (A view of an older part of Sosnowiec is shown above.) Like all of Poland, this region has a very complicated history. It was an important merchant city because of its location near the borders of the German, Russian and Austro-Hungarian Empires. 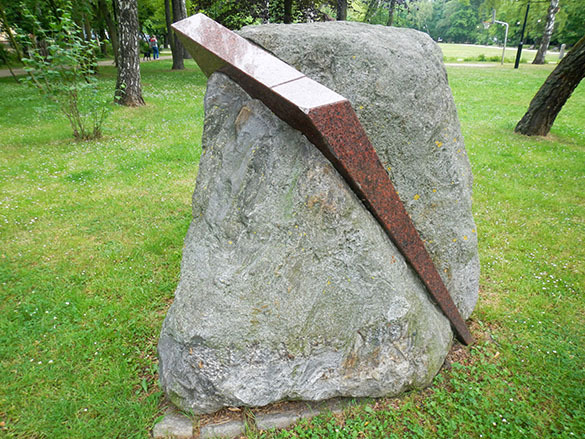 Its main industries were badly damaged in World War I, and it was one of the first places occupied by Nazi Germany at the start of World War II. The heavy hand of 1950s communist architecture (large concrete block buildings) has been somewhat muted by recent renovations. 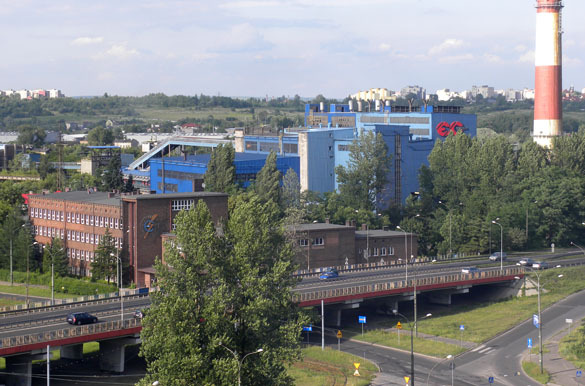 An industrial part of Sosnowiec. Michał made certain I had a good traditional Silesian-Polish meal this afternoon. It began with a soup called “zurek” made with potatoes, hard-boiled eggs, mushrooms, tiny cubes of beef, and something that gave it an almost lemony-sour taste. Our main course was “ruskie perogi” filled with potato, white cheese, and fried onions. These apparently come from Red Ruthenia, a region now in Ukraine. It is going to be a multicultural scientific experience this week! 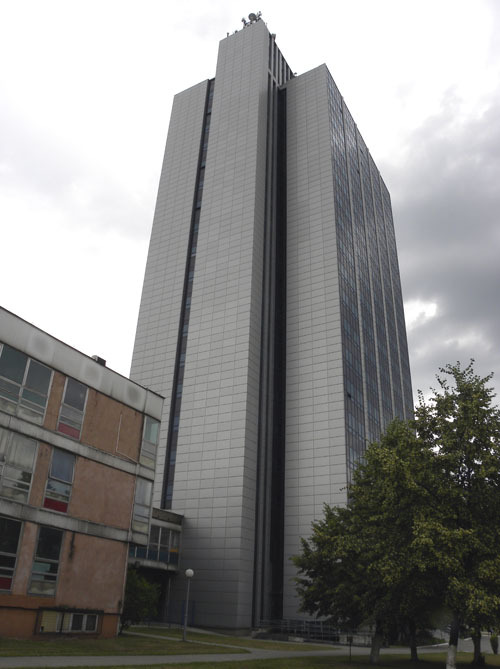 The very tall Earth Sciences Department building on the campus of the University of Silesia. They take their geology very seriously here. 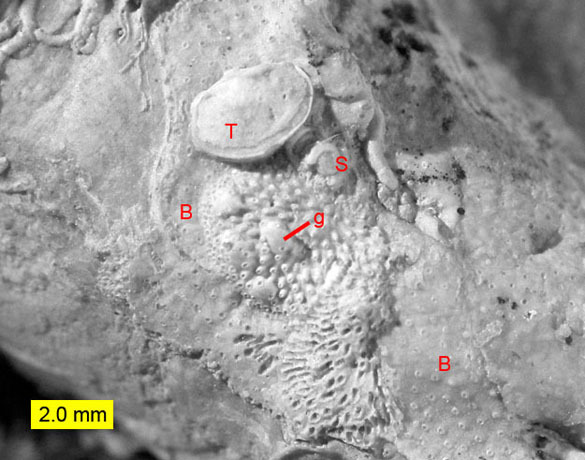 T=thecideide brachiopod; B=cyclostome bryozoans; S=sabellid worm tubes; g=gonozooids on one of the cyclostome bryozoans. This delightful little community is the subject of a current research project that developed from Independent Study fieldwork in 2006. Elyse Zavar (’07) and I traveled to southern Poland to work on Jurassic fossils associated with a carbonate hardground at the Callovian-Oxfordian boundary near the village of Zalas (the link goes to Elyse’s photographs). With our Polish colleagues we found complex stratigraphy and an even more complex set of fossils. Now Elyse (a graduate student in the great state of Texas) and I have joined with Michał Zatoń of the University of Silesia in Sosnowiec, Poland, and submitted a manuscript describing and interpreting the sclerobionts (hard substrate dwellers) on the large limid bivalve Ctenostreon proboscideum. Michał is the lead author because of his long experience with these fossils and the complicated stratigraphy. The hardground complex in the Zalas Quarry, southern Poland. It is Callovian below the blade of the well-traveled hammer and Oxfordian above (both stages of the Jurassic). I have a soft spot for thecideide brachiopods, so they’re the stars of this show for me. I’ve come across them on Jurassic hard substrates many times, so they are old friends. They are filter-feeders like their larger brachiopod cousins, but they cemented one valve to a shell or rock for stability. The bryozoans in this community are also fun, especially when they have gonozooids as imaged above. A gonozooid is a specialized zooecium for brooding eggs and larvae. They are sometimes the only diagnostic features on sheet-like cyclostome bryozoans. There are plenty of serpulid and sabellid worm tubes as well, along with occasional oysters, calcareous sponges, and borings. A sabellid worm tube and other encrusters. We are comparing this Polish Jurassic community to others of the same time interval around the world. Curiously and probably not by chance, a similar sclerobiont assemblage is found in the Middle Jurassic of southern Israel — the subject of another Wooster study.